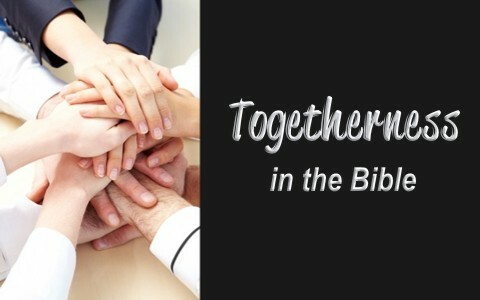 What does the Bible say about “togetherness?” Why is it important? The word “together” is an adjective and according to the etymology dictionary, it means “to be present in one place,” “in a group,” or “in an accumulated mass.” The word “together” is a variant of the adverb “geador” and means “to unite, to join” or be “in a body” and that seems perfectly fitting to the concept of being together as the Body of Christ, the church. We are united in one body and with one mind, “to be present in one place” of worship. When the word is used as a verb, it means “to accompany” or (I really like this one) “to agree with” or “to harmonize.” That’s what the church should be. We should be in harmony with one another as we are in harmony with biblical teaching. The first century church was unique to time and history as they were “together’ to begin with and then endured much persecution, together, and also prayed and stayed together as one body of Christ. Before the Day of Pentecost, “All these with one accord were devoting themselves to prayer, together with the women and Mary the mother of Jesus, and his brothers” (Acts 1:14) and then “When the day of Pentecost arrived, they were all together in one place” (Acts 2:1), so since the very beginning, the church was “of one accord” and “all together in one place,” so togetherness for the church means being together in body, in mind, in spirit, and in unity. In fact, the early church was, “day by day, attending the temple together and breaking bread in their homes, they received their food with glad and generous hearts” (Acts 2:46), and as a result of this unity or togetherness, they were “praising God and having favor with all the people” which led to the Lord adding “to their number day by day those who were being saved” (Act 2:47). What I mean by togetherness in shoe leather is what it looks like in life. Early on the apostles and Christ were concerned that we’d all be agreed together in doctrine and faith, so the Apostle Paul asked, “Complete my joy by being of the same mind, having the same love, being in full accord and of one mind” (Phil 2:2), since “where two or three are gathered in my name, there am I among them” (Matt 18:20). The only times the Holy Spirit moved in great power among a group were when the believers came together as “when they had prayed, the place in which they were gathered together was shaken, and they were all filled with the Holy Spirit and continued to speak the word of God with boldness” (Acts 4:31). It’s much easier to be bold and speak the Word of God with boldness when we are filled with the Holy Spirit but also when we are “gathered together.” Dozens of times when the church was gathered together, it says they “were gathered together and were praying” (Acts 12:12), indicating corporate prayer is vital to the church and the only times when the place was shaken was when “they were gathered together.” This never happened in isolation or when church members were separated from the others. Even at the Jerusalem conference, “The apostles and the elders were gathered together to consider this matter” (Acts 15:6). There is strength in numbers and so together we are stronger than we are individually. That’s another reason togetherness matters. We can already conclude that the church is one body composed of many members, but when the members become divided, it divides the Body of Christ, the church. This surely grieves the Head of the Church, Jesus Christ, so God inspired Paul to write to the Corinthians and tell them, “you are still of the flesh. For while there is jealousy and strife among you, are you not of the flesh and behaving only in a human way” (1st Cor 3:3)? The Scriptures say, “God is faithful, by whom you were called into the fellowship of his Son, Jesus Christ our Lord,” (1st Cor 1:9), and fellowship with the Son of God doesn’t happen in isolation alone. Of course, we each have relationships with Christ but collectively we are His body. God has called “us” and not just you and I. We come as a set because we can’t love God and worship God by ourselves. We need one another. God never works through “lone ranger” Christians but always in community. The gifts of the Spirit are meant to serve the church and are not for our benefit alone. We can say we love God but if we don’t love the people of God, how can we truly say “we love God” and mean it? The Apostle John said “We know that we have passed out of death into life, because we love the brothers. Whoever does not love abides in death” (1st John 3:13). You can’t say I love God but not your brother or sister in Christ. Imagine someone telling you, “I love you as a friend, but I can’t stand to be around your children.” I doubt very much your friend would like that, so certainly God is not pleased when we say we love God but don’t want to have togetherness as the Body of Christ. There are dozens of commands given to the New Testament church that contain the phase “one another.” One such command for the church is to not forsake the assembling together for worship (Heb 10:25), but rather, “let us consider how to stir up one another to love and good works” (Heb 10:24), and you can’t stir up one another if you’re not with one another. We’re even told to “confess your sins to one another and pray for one another, that you may be healed” (James 5:16). The church is to be held accountable to one another and to restore a sinning brother if need be (Matt 18:15-20), so there is a vital necessity for the church to have togetherness. It is God’s will that “you increase and abound in love for one another and for all, as we do for you” (1st Thess 3:12), “Therefore encourage one another with these words” (1st Thess 4:18). Let us “encourage one another and build one another up, just as you are doing” (1st Thess 5:11) and “See that no one repays anyone evil for evil, but always seek to do good to one another and to everyone” (1st Thess 5:15). That’s why it’s vital for the church to have togetherness. The original word “together” means “to be present in one place,” “in a group,” or “in an accumulated mass,” or as the adverb “geador” means, “to unite, to join” or be “in a body.” That seems perfectly fitting to the concept of being together as the Body of Christ, doesn’t it? Something else that might interest you: What Causes Churches to Split? Previous post: What Does It Mean To Be A Slave Of Christ? Next post: What Does it Mean to be Chosen by God?